The genesis of the Ryno one-wheeled electric motorcycle can be traced back to a moment when Chris Hoffman’s daughter asked if he could build something like what she saw in an episode of Dragon Ball. A few years later, the Ryno is now a reality, and now it’s also street legal! 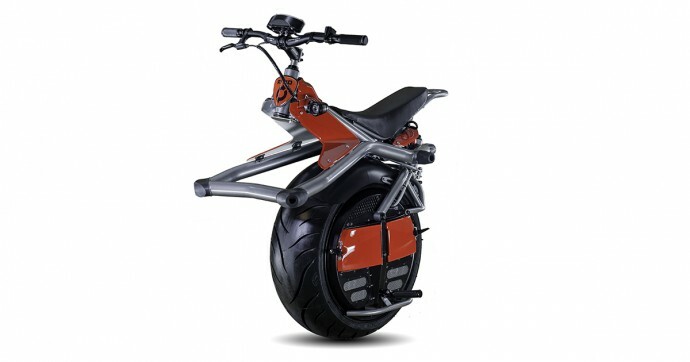 The RYNO Motors Microcycle is essentially a motorized unicycle self-described as “Half the bike. Twice the fun.” The one-wheeled vehicle takes up less room than a regular bicycle which makes it a convenient form of transportation. It includes a five-horsepower electric motor, which is very quiet and can reach speeds of up to 10 mph and a range of up to 12 miles on a single charge. The RYNO works like a Segway – the driver must lean forward to accelerate and backward to decelerate. But unlike a Segway, the RYNO scooter is also fitted with self-balancing technology that means the scooter will automatically right itself if the driver leans too far to the left or right, or too far forward or backward. You can ride the Ryno sitting down, but it’s easier if you hop up and stand on the foot pegs. Avoiding obstacles by drifting left and right was accomplished by simply looking where you wanted to go, aligning your shoulders in that direction, and letting the Ryno do the rest.Leaning back slows you down and you could simply put your feet on the ground when you are ready for a full stop. The Ryno is a beautiful machine, with the slick lines and vigorously mechanical look of a sports car or high-performance motorcycle.